Despite the fact that it is only in it's fourth year, IlluXcon has quickly become one of, if not 'the', best con for those interested in SFF art. Just about every major genre illustrator exhibits there, and the weekend is jam packed with live demos and lectures. Another exceptional aspect of the con is it's scholarship. 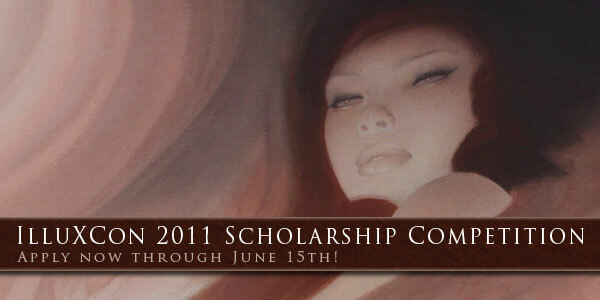 Last year, IlluXcon granted all expense paid trips to the con to three very deserving students. I repeat... 'all expense paid'. That means they cover your travel expenses as well! The 2011 competition will be judged by: Jon Schindehette of Wizards of the Coast, Lauren Panepinto of Orbit Books, Brom, James Gurney, and Kekai Kotaki. Submissions for this scholarship just opened. So go to IlluXcon's website, and apply! You can only submit one piece, and you only have until June 15th. Don't think you have anything good enough in your portfolio? Make something for it... paint THIS!